Meet Naia-one of the oh-so-glam mannequin girls with fashions that are off the hook! Your Style Doll's hairstyle, top, bottom and shoes come apart and easily hook back together so you can customize her from head to toe. Naia's ready for a brand-new look styled by you! Step into her fashion-packed Style Studio that comes with six fashions and six accessories to create 100+ cool-girl looks! 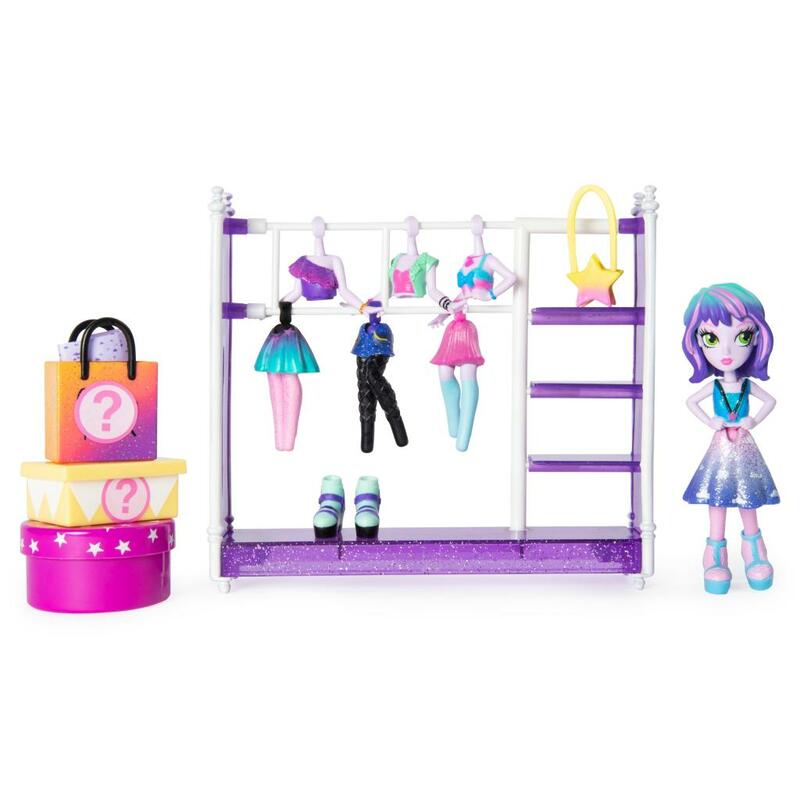 The boutique-like, open clothing rack has two rods and pretty, translucent purple shelving to hang and display your Off The Hook fashions and accessories. Getting dressed up is easy when you can see all your fab fashions at a glance! Mix and match the colorful trendy fashions that easily hook together to create unique looks for Naia! Then add trendy accessories for the finishing touch. Get fashion inspo in the full-color, lookbook of outfit ideas included. Love surprises? Find four mystery accessories inside the shopping bags, shoe box, and hat box included! Unbox handbags, shoes and more-what will you discover? The Off The Hook Style Studio is the perfect gift for aspiring fashionistas who wanna have fun with fashion! PLAY & DISPLAY CLOTHING RACK: Mixing and matching outfits is easy when your wardrobe is on full view in the Off The Hook Style Studio! Hang your chic fashion pieces on double hanging rods that hold up to five tops and five bottoms. Showcase your favorite handbags, sunglasses and more on the display shelves. Line up your shoe collection along the bottom shelf. You can even hang hairpieces and hats on the four posts at the top of the clothing rack. Take a look and be inspired to create an awesome OOTD! 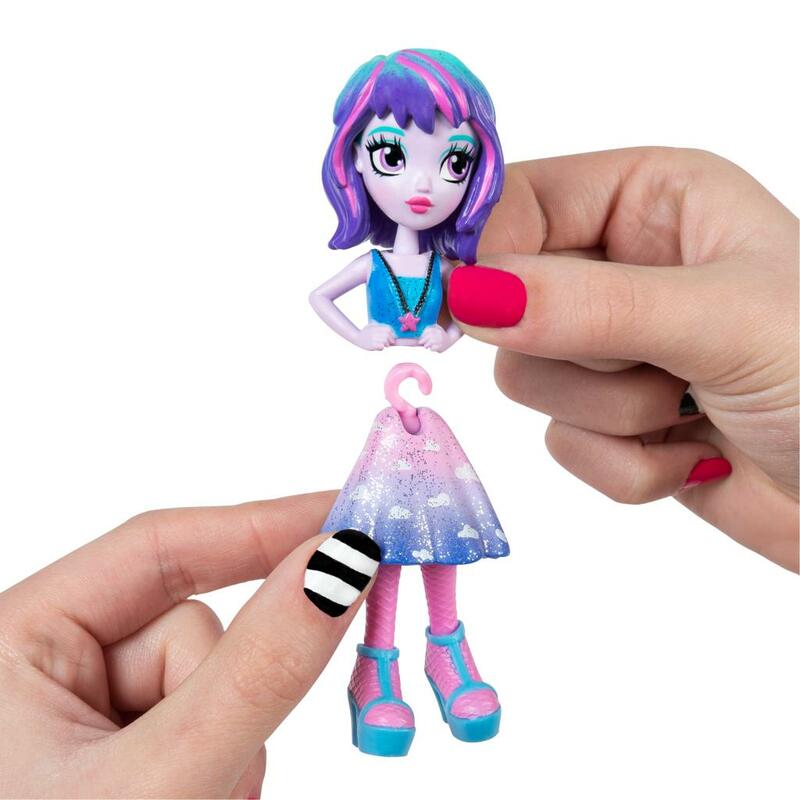 CUSTOMIZE STYLE DOLL FROM HEAD TO TOE: It's up to you to decide what's cool! Start with your small doll's pretty face, then add a sleek hairstyle, ruffly top, swirly skirt, strappy shoes, and fun accessories. Easily hook together fashion pieces to create unique, fashion forward looks. Change your mind? Outfit changes are quick and easy-just start over and create new looks again and again! 6 FASHIONS + 6 ACCESSORIES = 100+ FASHION COMBOS: It's easy to mix and match Off The Hook fashions and accessories for endless looks! The more fashions you collect, the more outfit combinations you can create! Some fashion pieces have metallic or sparkly details-some even have rainbow glitter! The Style Studio comes with six fashions and six accessories (four mystery accessories are hidden in shopping bags, a shoe box, and a pretty hat box). Unbox cool handbags, shoes and more to add to your doll's wardrobe! Re-use the shopping bag, shoe box and hat box to store your fashion surprises after play. The Off The Hook Style Studio is the perfect gift for girls and aspiring fashionistas aged 5 and up. Collect more Off The Hook Style Dolls and Off The Hook Style BFFs for endless ways to style and play!